Relative humidity is the term used to describe the moisture content of the air in our homes and outdoors. If you are seeking an affordable and easy way to monitor the relative humidity in your home, a digital hygrometer will do the job for you. There are some great and well-priced digital hygrometer options on the market. But before we look into the best digital hygrometers that are available, let’s have a quick look at why you may want to monitor the humidity in and around your home. Dry or wet conditions can have an impact on our homes and its contents. Humidity can cause a great deal of damage. When the relative humidity is too low it can cause wood to crack. When it is too high, it can create mold, mildew and not only damage structural integrity, it can make us sick. In addition to this, and possibly more importantly, there are many health conditions that can be triggered but too much or too little humidity. A hygrometer helps you to monitor and keep the humidity in the proper zone. A hygrometer does not actually adjust the relative humidity. A hygrometer gives you a means of measuring the humidity level in your home. You can then use a good humidifier or dehumidifier in order to correct the relative humidity when required. There are several different types of hygrometers in the market. They fall under two basic categories. These are analog or digital hygrometers. You can also get indoor and outdoor hygrometer versions of each type. In addition, hygrometers are battery-operated or electronic using power from your home electrical system. The number of features on each style varies with price determining the actual number of features and total functionality of an individual unit. Generally speaking, once you set up your hygrometer, there is little in the way of maintenance. The exception being models that require batteries and outdoor models that may require replacement after years of exposure to the elements. Essentially, having the ability to monitor the relative humidity in your home allows you keep your living space comfortable. Much like a thermometer permits you to control temperature, a hygrometer allows you to closely monitor humidity and adjust it if required. The following are our choices for the best digital hygrometers currently available. 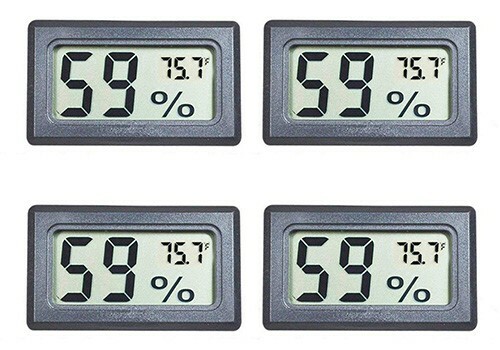 The design of this hygrometer makes it not only easy to operate, but it is easy to read as well. There are few buttons which removes any level of complication. Temperature readings can easily be switched from degrees C to F and the LCD display is easy to read from a distance. One added feature of this product is a Comfort Level Indicator. This will display an icon that will identify safe and unsafe humidity levels that can be identified with just a glance. The digital thermo hygrometer is also in a small but handy size measuring 1.8 inches by 2.3 inches. It comes with a lifetime warranty and is highly reliable and accurate. The unit measures humidity every 10 seconds and has 24 sensitivity vents that provide accurate information from your living space to the monitor for both temperature and humidity. There are three mounting options built into this product. Depending on where you intend to use it, you can stand it on a table, attach it with magnets or hang on a wall. It comes complete with a battery that will provide up to six months use as soon as your load it. 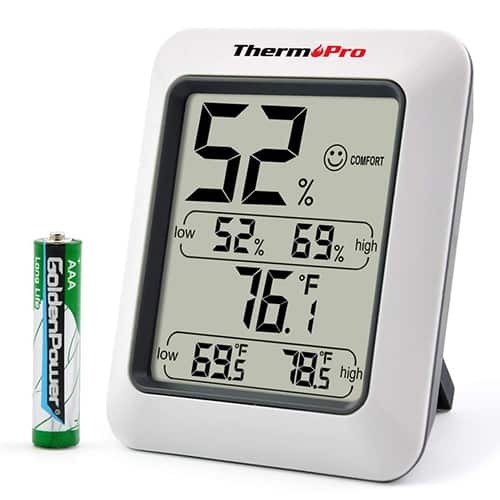 The simple design of this electronic hygrometer makes it easy to use and even easier to read. With a LCD display, you will have both relative humidity and temperature readings. In addition, the display shows the high and low for both that has been recorded. There is also an Air Comfort Indicator which features an icon that indicates when the humidity level is Dry, Comfortable or Wet. It comes complete with a 1 year warranty but after purchase, you can extend that to a 3 year warranty by calling customer service. 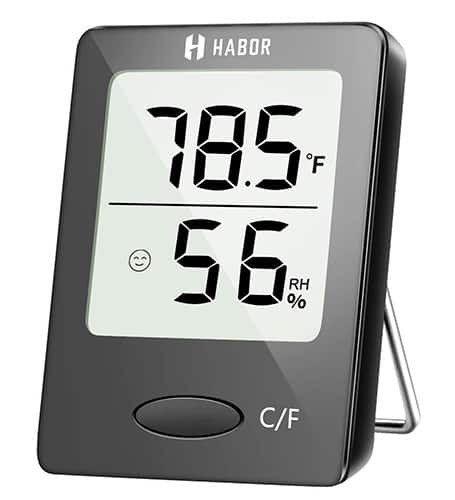 This digital thermometer hygrometer can be magnet mounted or used on a tabletop. The readings are easily switched from F to C and are battery powered by a single AAA battery, which is included. The white face makes this an easy one to fit into any décor. These are called mini digital humidity meters and that is why this contains a set of four. You can use them in four different areas and none of them will take up much space while monitoring humidity and temperature. They are essentially 2-in-1 meters. Each mini meter contains a built-in probe which calculates the air temperature and moisture content. Once the levels are determined, they are displayed in the large LCD screens. The temperature readings are in degrees Celsius or Fahrenheit. The accuracy of these units is rated at +/- 2F (temperature) and +/- 5% RH (humidity). 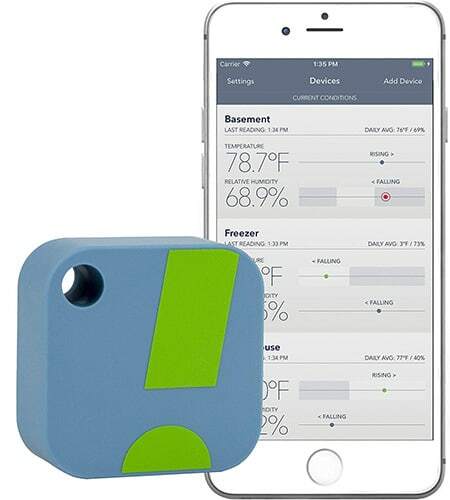 They are easy to use and easy to mount wherever you need to monitor temperature or humidity. Each is battery operated and ready to use once received. Featuring a large 4-inch LCD screen with huge digits and blue backlight for easy reading, you’ll be able to see current conditions from a distance. This is the most accurate digital hygrometer that will display indoor/outdoor temperatures as well as humidity percentages. The backlight automatically shuts off after 15-seconds and the display will also show trend indicators for both temperature and humidity. It also has a low battery indicator and can be wall mounted or magnet mounted for easy access. The touch screen feature lets you set it up to view readings from up to three outdoor remote sensors. You can also switch between degrees F and C. It also records readings from the past 24 hours so you can quickly identify a developing trend. This is what would be considered a professional style digital thermometer and humidity meter. It is designed for use in various industries including agriculture, medical, construction, environmental as well as for home use in living and office areas. It is designed to combine the functions of humidity meter, temperature meter, wet bulb temperature and dew point temperature. This is the perfect tool for HVAC, indoor air quality and other applications that require professional level accuracy. 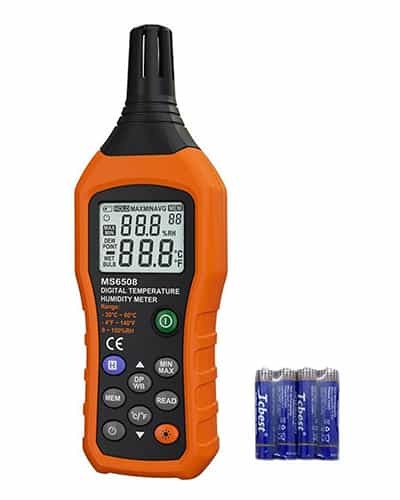 In addition to fast response time, this product has a large LCD display which shows all data you would require related to temperature and humidity. There’s also a backlight with a sensor that will brighten the LCD display when required and has an auto shut off. The ABS plastic case is in orange and black and is dust and splash proof. Made to be durable, the outer case is strong and attractive. It operates on 4 batteries, which are included. The package comes complete with a carry bag to hold and protect the meter. It looks like a strange little blue and yellow box but it is so much more than that. It is a small digital hygrometer that houses all the sensing tools that will provide you with accurate and constant information on the current conditions of your home. But you need to connect it to your iPhone or Android device with a handy to use and understand app. Once connected, you’ll see readings on your phone coming from that strange looking blue and yellow box sitting on your kitchen cabinet (or wherever). The unit packs a powerful punch giving you readings from as far away from it as 325-feet, depending on the number of obstructions. The apps are designed with you in mind to make monitoring easy and simple and expandable, if desired. By adding the SensorPush G1 WiFi Gateway (sold separately) you can monitor your home conditions remotely via the internet. The blue and yellow box has simple set-it-and-forget-it operation with Swiss-made sensing components. 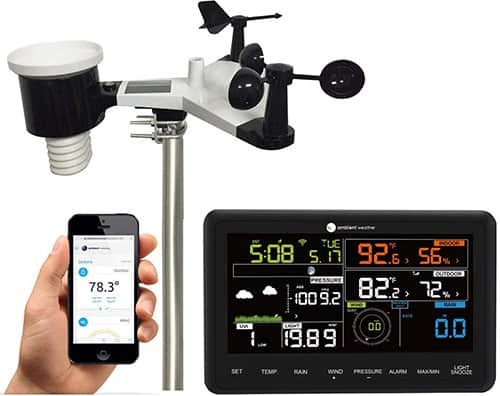 This is a completely portable weather station that you set up in your backyard. 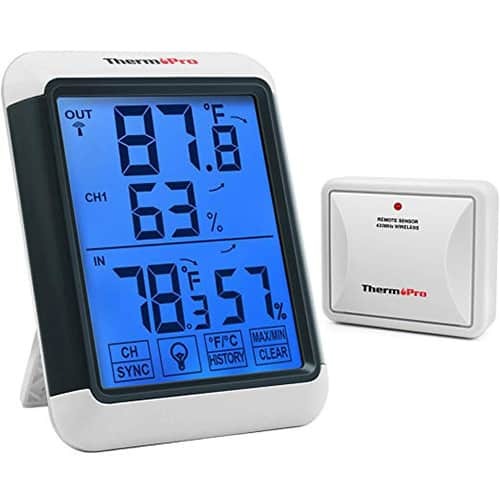 It will enable you to monitor both your indoor and outdoor weather conditions with a LCD display that features a great deal of data on an easy to read screen. The weather station will measure wind speed and direction, rainfall, outdoor temperature and humidity, solar radiation and the UV level. It will also calculate dew point, wind chill, heat index and barometric pressure for a complete weather picture. The enhanced WiFi connectable option will give your backyard station an added feature. It will have the ability to transmit the data it is collecting wirelessly to WeatherUnderground, the world’s largest personal weather station network. The app may not connect to phones with older OS. There are many solutions available for monitoring humidity levels. Whether you are controlling the relative humidity in a wine cellar, a guitar case or the entire living space of your home, you will be able to find the right tool to fit your needs. Digital hygrometers are typically a bit more expensive than analog styles but with smaller designs, digital models are as affordable as ever. If your intention is to monitor the humidity levels to keep it at a safe and comfortable level in your living space, any of these models will suffice.